Just weeks after the launch of the Beyond Burger in the UK was postponed due to production shortages, stocks have now completely sold out shortly after being added to the menu of Canadian burger chain A&W. A & W is Canada’s second-largest hamburger chain. 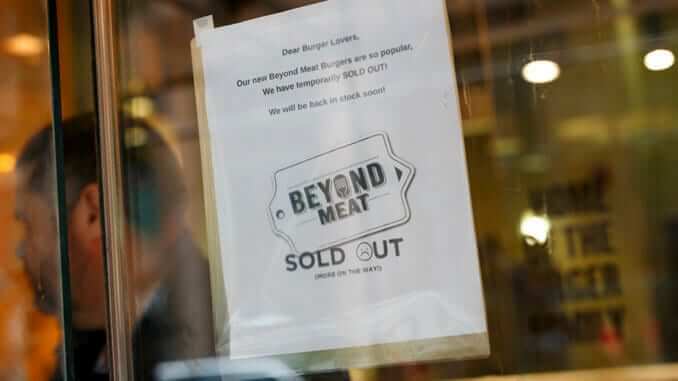 This summer they announced that they would be responding to public demand for plant-based protein by becoming the first national burger chain in Canada to offer Beyond Meat’s famous product. The California based firm have received intense hype and publicity around the world, helped of course by the celebrity investors Bill Gates, Leonardo DiCaprio, and Twitter co-founders Biz Stone and Evan Williams. In 2013, A &W began to make changes in accordance with consumer preferances for transparancy and increased information about food and ingredients, removing from their menus all beef raised with added hormones or steroids and chicken raised with antibiotics. The addition of the Beyond Burger is a continuation of their reaction to consumer desire for more natural foods, according to Ms Senecal. This news comes in a long list of recent news about veganism in Canada. Their largest packaged meat company, recently acquired Lightlife Foods, and Globally Local announced that they will be producing 250,000 bleeding burgers per month, and plant-based restaurant chain Copper Branch are now expanding into the US after huge success at home.